Digital communication can be considered as the communication happening between two (or more) devices in terms of bits. This transferring of data, either wirelessly or through wires, can be either one bit at a time or the entire data (depending on the size of the processor inside i.e., 8 bit, 16 bit etc.) at once. Based on this, we can have the following classification namely, Serial Communication and Parallel Communication. Serial Communication implies transferring of data bit by bit, sequentially. This is the most common form of communication used in the digital word. Contrary to the parallel communication, serial communication needs only one line for the data transfer. Thereby, the cost for the communication line as well as the space required is reduced. 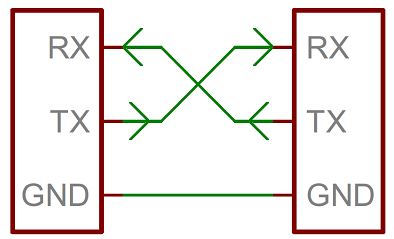 Parallel communication implies transferring of the bits in a parallel fashion at a time. This communication comes for rescue when speed rather than space is the main objective. The transfer of data is at high speed owing to the fact that no bus buffer is present. For a 8 bit data transfer in Serial communication one bit will be sent at a time. The entire data is first fed into the serial port buffer. From this buffer one bit will be sent at a time. Only after the last bit is received the data transferred can be forwarded for processing. While in the Parallel Communication a serial port buffer is not required. According to the length of the data, the number of bus lines are available plus a synchronization line for synchronized transmission of data. 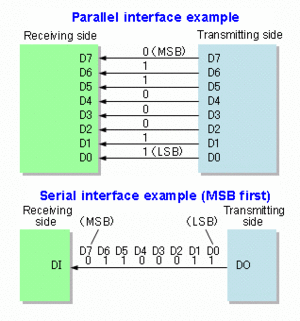 Why serial communication is preferred over parallel? While parallel communication is faster when the frequency of transmission is same, it is cumbersome when the transmission is long distance. Also with the number of data channels it should also have a synchronous channel or a clock channel to keep the data synchronised. In Serial the data is sent sequentially and latched up at the receiving end thus procuring the entire data from the data bus using USART/UART (Universal Synchronous Asynchronous Receiver Transmitter) without any loss in synchronisation but in parallel even if one wire takes more time to recover the received data will be faulty. This crosstalk worsens over length hence putting an upper limit on the length of the parallel transmission. Thus it finds its place in the computer peripheral buses and RAM where speed cannot be compromised and the length has to be short. The Serial Communication gives an option to increase the frequency of transmission without hampering the data while it is not possible in case of a parallel communication. The window for data collection at the receiving end reduces with every step increase in the frequency. This increases the difficulty and eventually results in gibberish data. The COM connectors in our laptops and PCs are a typical example of serial communication. Ethernet, I2C (inter-integrated circuit), SPI (Serial Peripheral Interface) and UART/USART all follow serial interfacing. The RS232 (Recommended Standard-232) comes under UART. This requires two channels – one transmitter and one receiver. In addition to it, it requires a common ground too. This has a full duplex communication as the wires for both the TX-RX communication is different. Full duplex communication means that the transmission and reception can occur simultaneously. The data transmission requires a start bit, an end bit and a parity bit. The start bit initiates the communication by informing the receiver. The end bit indicates the end of the communication. While the start bit is compulsory, end bit is optional. The USART needs a common clock line but the RS232 being UART does not require one. Instead it waits for the start bit. The data size varies from 5 to 9 bits. The requirement for RS232 communication is that the baud rate of both the transmitter and receiver should be same. Baud rate is the rate of change of state (from 0 to 1 or vice-versa) in a line. The UART generally speaking, converts the signal into electrical pulse such that it can be transmitted. The maximum distance for transmission with UART is less than 50 feet. The Parallel port are now virtually non-existing because of the universal serial bus (USB) being extensively used. Certain computer buses though continue to use the parallel communication. 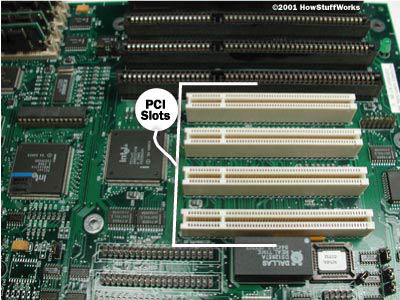 The Conventional PCI (Peripheral Component Interconnect) is one of the parallel bus. It uses a single synchronous clock bus.